Tremolo is the technique of picking one note on your ‘ukulele in rapid secession. It sort of melts the note into a wall of machine-gun sounds. Tremolo is usually played with your index fingernail. I’ve seen it done with the thumbnail, but it’s more of a challenge. First, anchor a couple of your right hand fingers to the ‘ukulele soundboard, below the sound hole (I use my pinky and ring fingers). Use these fingers as a pivot point. Place your index fingernail on the string, rock your whole hand forward on the “pivot fingers” so that you pick the string. Keep the first knuckle in your picking finger floppy so that it slides easily off the string. Picking up is just opposite – rock your pivot back so that you pick in the other direction. Go back and forth very slowly until you get the feel for the motion. Then start gradually speeding up. You can’t spend too much time practicing this slow. A more advanced way to produce tremolo is with a roll of your fingers. This technique relies less on a fingernail so it might be a good alternative if you have bolo-head fingers. Start by picking up with your middle finger, and then with your index. Follow those two with a downstroke of your thumb. Then start all over again. Start slowly and as you get the hang of it, speed up. 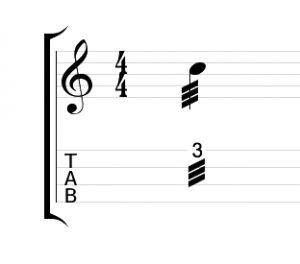 Bryan Tolentino uses this kind of tremolo in G Minor Fleas with Herb Ohta Jr.
A great example of tremolo in a song is Brittni Paiva’s version of Csardas from her album Brittni. The whole first part is a lesson on the technique. Check out my tab for Csardas on the tabs page.